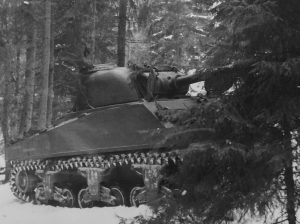 Another report on the Swedish experiences with the Sherman. This is an earlier one, from 1947, and only covers the M4A2 and M4A4. It’s a lot terser than the first one, probably since was an internal report written for the 1946 armor committee by one of its members. The armor committees of the 1940’s were joint groups made up by people from both the Ordnance Administration and various army formations, including the armor school, tasked to figure out where armor technology was going and recommend appropriate responses to the higher-ups. Without further ado, here’s the translation. The differential steering offers very good performance on roads and on hard ground in terrain. On soft ground the downsides become apparent – the “differential effect” of the steering (translator’s note: it is not clear exactly what this refers to). There is no neutral steering nor any possibility to do a clutch-brake turn, which has turned out to be a noticeable downside since the turning radius is large. The steering levers are close to each other, so the driving position is comfortable. The steering gear has effective cooling and lubrication, and additionally the brake discs (TN: unsure about terminology here, the Swedish word used is literally “brake belts”) operate submerged in oil, so there is rarely any reason for adjustment. During a road march of about 150 km, the steering gear casing did become very hot to the touch, but the oil temperature never showed more than 110° F, while the maximum allowed is 160° F. There was no noticeable degradation of the performance of the steering gear; it was the same at the end of the march as it was at the start. There is no parking handbrake nor any brake pedal, but the steering levers can be locked in the rear position. Hereby the extra devices needed for a dedicated braking system can be avoided. Easy to switch gears, effective synchronisation. Can be said to be on par with the transmission in the pvkv m/43. There is no overdrive. Separate oil coolers for the transmission and the steering gear. Durable and effective, but vulnerable because the road wheels are mounted in pairs. The tanks move smoother and have a more even ride in terrain than Swedish tanks do. When driving on wet surfaces or in upslopes in terrain, the track with rubber pads shows tendencies to slip, which makes the steering not fully effective. Terrain driving performance and obstacle passing is otherwise about the same for the tank with the rubber padded track as it is for the tank with the steel track. The steel tracks are heavy and make a considerable amount of clattering noise. They are likely to be more vulnerable than “skeleton tracks” (TN: it seems likely that by “skeleton tracks” the author is referring to track links with some sort of hole or gap in the link rather than ones that are completely solid). The arrangement of the guide horns in two rows on the outer sides of the road wheels is fit for its purpose, especially when driving in terrain. The design of the track links – whole links without holes – makes gravel and mud amass in the tracks when driving in difficult terrain and on loose soil. The cast design causes certain unpleasant vibrations in the turret when driving. Since the tanks are tall, lurches and other movements are more noticeable than in Swedish tanks. These factors make the personnel show a certain reluctance to stand in the turret while driving in terrain. Manual traverse is easy to handle because of the powerful gear ratio – 1/4 turn in 28 seconds (strv m/42 23 seconds). Power traverse by wheel turning (TN: no idea what is intended here, literal translation again) – 1/4 turn in 6 seconds, full rotation in 26 seconds. Power traverse with the control set at full power – 1/4 turn 4 seconds, full rotation 19 seconds (strv m/42 1/4 turn 7,5 seconds, full rotation 24 seconds). The tank commander can power traverse the turret at full speed from his position in the cupola. The turret traverse braking is very effective – as soon as the traverse wheel stops turning, the turret also stops immediately. When power traversing, the turret automatically returns to the position it had when the wheel stopped turning. On the M4A2, the handle on the traverse wheel has a latch, which is pressed when traversing. When this latch is released, the turret is braked. The turret design with a turret basket that the crew sits in is clearly superior to the strv m/42 (TN: which didn’t have one). The walls of the turret basket are made of perforated sheet metal, so you can see through them. The gyroscopic stabilization affects the weapons and the telescopic sights, and seems to be effective and rugged. The weapons are loaded from the left side of the gun – that is, with the right hand. Why is it not done like this in our tanks? It seems appropriate for the heavy rounds in question here. The observation cupola is used as a ring mount for a 13 mm anti-aircraft machine gun. There is a tachometer, which is very important on these tanks since they don’t have a speed governor. The drivers quickly learn to switch gears based on the tachometer readings. All instruments are electrically signalled, even the oil pressure. Signal lamps are used to a large extent, for example to indicate that the engine has the proper working temperature. The same gauge is in several cases used for different purposes, for example indication of oil and fuel amounts in various tanks – a switch is used to control which device is measured. Automatic fuses are used consistently in the electrical systems. They are placed easily visible on the instrument panel. There’s plenty of room for ammunition – 96 7,5 cm rounds, 300 13 mm, 6750 7,65 mm – and for equipment. The connection plugs for the microtelephones (TN: intercom microphones or entire headsets?) are worth copying. On the M4A4, the commander can stop the engine from his position. At the rear of the tank, there’s a box with connectors for external telephone lines to the tank commander as well as for connecting an extension cord. There’s also a call buzzer button that alerts the tank commander here. There’s a separate auxiliary generator motor that charges the batteries and powers the turret traverse and radio while the main engine isn’t running. There is a fan in the turret for venting smoke and fumes. The swivel connector seems very effective and reliable. The seats are practically designed with a spring loaded mounting, which makes adjusting the seat height easy. The periscopes are made in two parts, so only the top part needs to be replaced in case of a hit or other damage. The antenna isolators are simple and robust, and are made entirely out of rubber. In the engine compartment on the M4A2 there is a starter button for each engine, which is very useful during checkups or maintenance work. Stowage boxes for the crew’s personal equipment as well as for the tank’s equipment are mounted on the outside of the vehicle. The refilling points for fuel, oil and water are clearly marked with text, covered by sturdy hatches and surrounded by a ring of armor. Large and sturdy design. A large number of informative signs as well as the well illustrated manuals ease the service and maintenance of the tanks. The electrical system is practically designed and easily comprehensible, with cables gathered into a small number of runs that are connected in switch boxes. Plug-type connectors are provided for the devices that are intended to be removable, such as the engine. On the M4A2, removing and replacing the engine takes roughly the same time as on the pvkv m/43. On the M4A4, only about half this time is required, since most devices remain attached to the engine when it is lifted out of the tank. The general impression of the tank is good. It is easy to drive, practically designed and durable. There have been no problems with training conscripts on the tank and its various systems. Few repairs have been necessary. 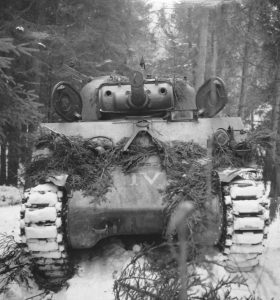 In 1946 and 1947, the Swedish army purchased a total of four surplus Shermans (first one M4A2 and one M4A4 without weapons, then a Firefly with the Continental radial engine and one M4 with the 10,5 cm howitzer) from the Brits, mainly to gain experience with foreign tank designs. A few attempts were made to purchase another 50 as surplus (they were very cheap, less than a thousand pounds each – you could get something like 50 modern, fully functional Shermans for the price of a single new build strv m/42), but this deal fell through because of difficulties with finding enough spare parts. A number of automotive trials were done with these Shermans under field-like conditions, and a few reports were written. One of them – from a winter exercise in 1948 – follows, translated in its entirety. If you’d rather read the original Swedish, here it is in PDF format. To the Inspector of the armored troops. Hereby the undersigned, whom pursuant to Ainsp/C no 23:8 of February 14 1948 was ordered to act as platoon leader of the Sherman platoon, respectfully remits a copy of “Memorandum with certain observations regarding the Sherman tanks in Swedish conditions during the field exercises of February 25 – March 4 1948”, which has previously been submitted to the Vehicle Bureau at the Royal Army Administration’s Ordnance Division. 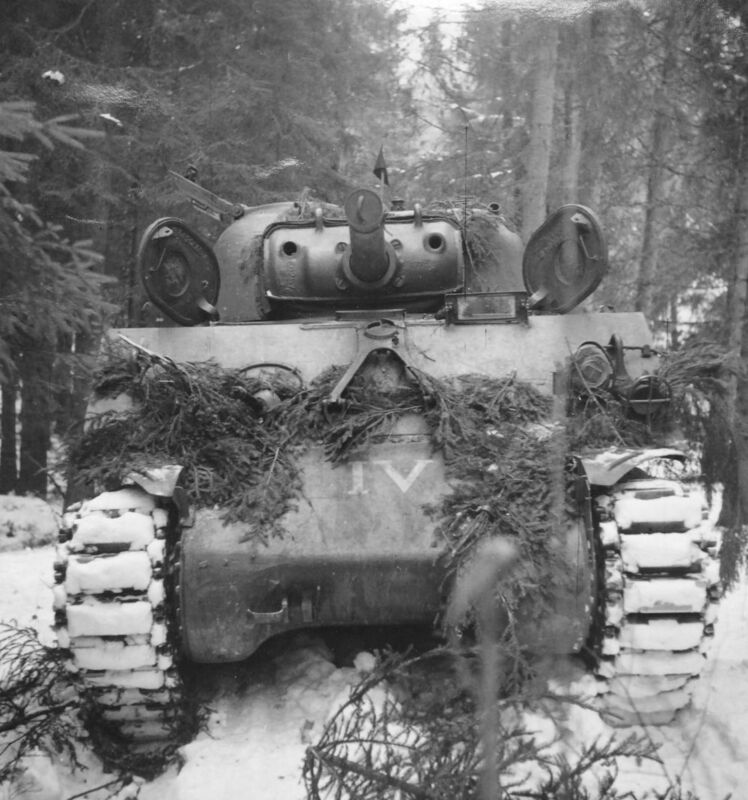 with certain observations regarding the Sherman tanks in Swedish conditions during the field exercises of February 25 – March 4 1948. March 1st, 1948. Photo credit: Westerlund/Försvarsstabens pressavdelning. The Sherman platoon, which participated in the field exercises pursuant to order Ainsp/C no. 23:8 of February 14 1948, consisted of one Sherman II (airplane engine), one Sherman III (diesel engine) and one Sherman V (Chrysler engines) as well as one terrängpersonbil and one KP-bil, and belonged to the 2nd tank company. At the beginning of the field exercises, the platoon was attached to 11th bicycle rifle co., IIIrd armor infantry bn. I 16, which advanced along the road Granvik – Olshammar – Askersund. The platoon remained attached to this unit until the end of the exercises. The road along which the platoon advanced was very bendy and hilly, and the road surface was mostly covered by hard ice. In several places the road was so narrow that passing or meeting other vehicles could only be accomplished with great difficulty. During the exercises large parts of the road were mined, and therefore mine hunting had to be done before the tanks could advance. Since the terrain did not permit off-road movement to pass the mined sections, the unit advanced slowly. After the exercises had ended, the platoon drove to Skövde along the route Askersund – Olshammar – Karlsborg – Tibro – Värsås – Skövde. The Cletrac steering has proven to be reliable and effective. The steering problems that have been observed on slippery roads is only caused by the track design (lack of spikes). There have been no issues whatsoever with the steering gears and no reparations or adjustments have been made, despite the drivers only having about an hour of training on these tanks before the field exercises started – they were thus rather unused to the tanks. The track assembly has stood up well to all stresses it has been subjected to. It has not been necessary to replace any road wheels or track links. However, the wedges that lock the track pins in place have shown a tendency to loosen and fall off, which is caused by the nuts eventually screwing themselves loose. Even when such wedges have fallen off, neither the track pins nor the guide horns have shown any tendency to move. If a split washer was added under the nut and the nut then tightened hard, the wedge remained where it should. 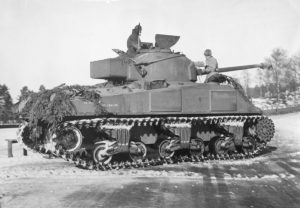 On icy and slippery surfaces the tracks on the Sherman V, which have U-shaped gripping surfaces, have shown to be unsuitable. On many occasions the Sherman V therefore happened to slip off the road, and on three such occasions one of the tracks was thrown. In one case, the tank could be driven directly back on to the track, but in the other two the track had to be removed completely and placed in front of the tank, which was then driven back on top of it. This repair required about two hours each time. The Sherman V also had problems climbing many steep slopes because of the tracks slipping. By using extra track links (TN: possibly for a different tank? the document is quite unclear here and has a few hard-to-read handwritten corrections), these slopes could be climbed, but this took considerable amounts of time. These extra track links, in sets of 3-5, were placed under the tracks with the guide horns facing down, and this provided extra grip. 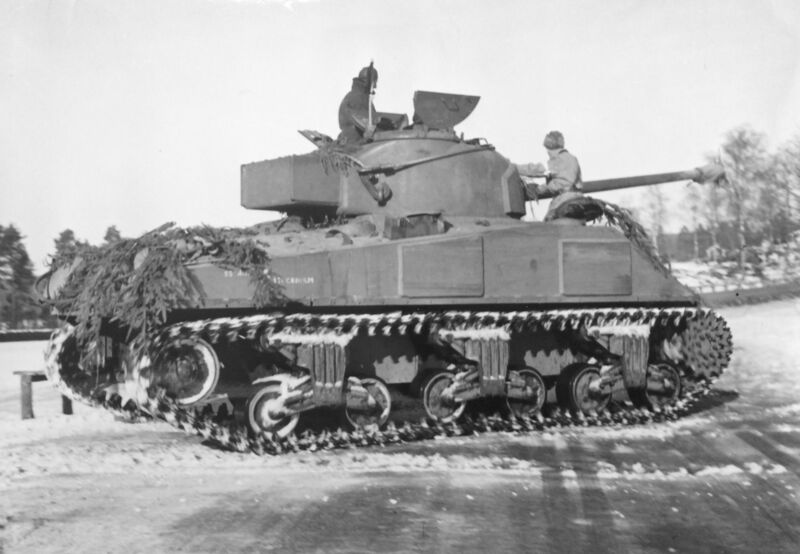 Since the Sherman V always was at the head of the column and showed poor performance on an icy road, the onlookers probably got the impression that the Shermans are hard to handle in winter. This is not the case, since the other two tanks never got stuck even once. When driving in terrain, all tanks passed the obstacles they had to pass. 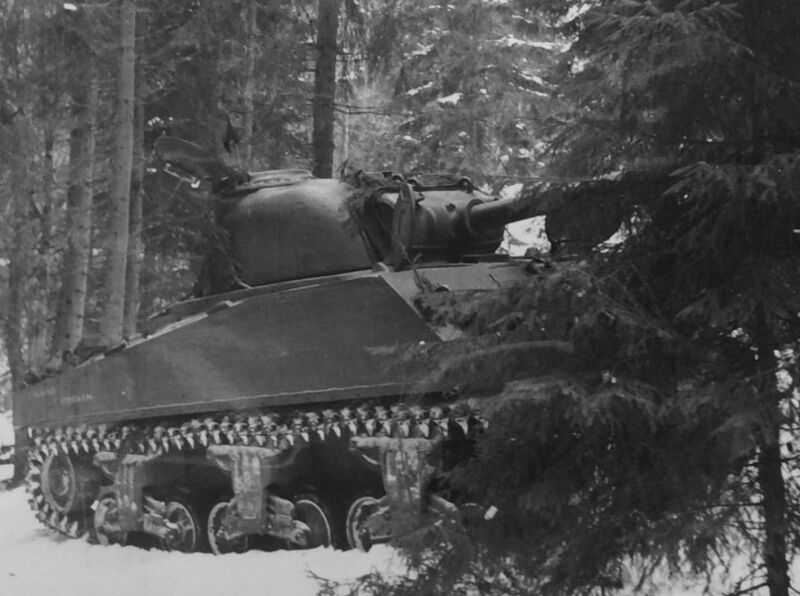 During the drive from Askersund to Skövde on March 2nd (TN: after the end of the exercises), the Sherman V happened to skid off the road in a curve and at low speed drove into a cliff face with the left drive sprocket. The sprocket wheel was crushed and had to be replaced with one from the Sherman that was not participating in the exercises. After the repairs, the tank continued towards Skövde. About 1 km west of Mölltorp, the tank again skid off the road when going downhill, and threw one of its tracks. 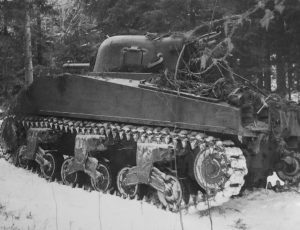 After pulling the tank back onto the road and re-mounting the track, the tank continued to Skövde without difficulties, since the road after that point was ice-free. The Sherman III with rubber tracks (TN: surely he means rubber padded tracks?) has proven to perform the best on slippery surfaces and was the easiest to maneuver. To some extent, this is likely because it is the lightest (28 tons). The transmissions has proven to be reliable and only one adjustment has been necessary. When the Sherman V collided with the cliff face, the fastening for one of the three clutch arms in the engine clutch was cracked. This was not discovered until the clutch started slipping in a slope after driving about 5 km. After adjustment, the tank could continue with no difficulties and without any noticeable slipping. The engines have functioned impeccably and no repairs or adjustments have been necessary. There have been no problems at all with starting, despite the night time temperatures usually being around -15° C (TN: 5° F). No engine heaters were used and running the engines to warm them up was only done during the rest period on the 28th and 29th, when the engines were run at 10 hour intervals. All engines started on the first try, and on the Sherman V it was not even necessary to use the primer. This is remarkable, since the tanks are not intended or equipped for winter use, other than “blinds” (TN: or shrouds) having been mounted to the radiators. February 28th, 1948. Photo credit: Westerlund/Försvarsstabens pressavdelning. The fuel consumption has been low, especially during pure road movements. During the entire field exercise, refueling was only done three times, and usually only one of the fuel tanks needed to be refilled. Altogether during the exercises, a distance of 215 miles or 350 km was covered. The high consumption on Sherman II was because the tank being driven about 30 km longer than the others and because it was used for towing on several occasions. The platoon started out at 1830 hours on March 2, and arrived in Skövde at 2300 hours, after a 40 minute break in Karlsborg. The high consumption on Sherman V was both because of the skids off road, where getting back onto the road consumed considerable amounts, and because the tank had to be driven on a low gear on the parts of the road that were the most slippery. The Sherman II and V have been fueled with lättbentyl (TN: a 75/25 gasoline/ethanol mix), while the Sherman III was fueled with engine fuel oil (TN: diesel). Oil consumption has been normal on all tanks. 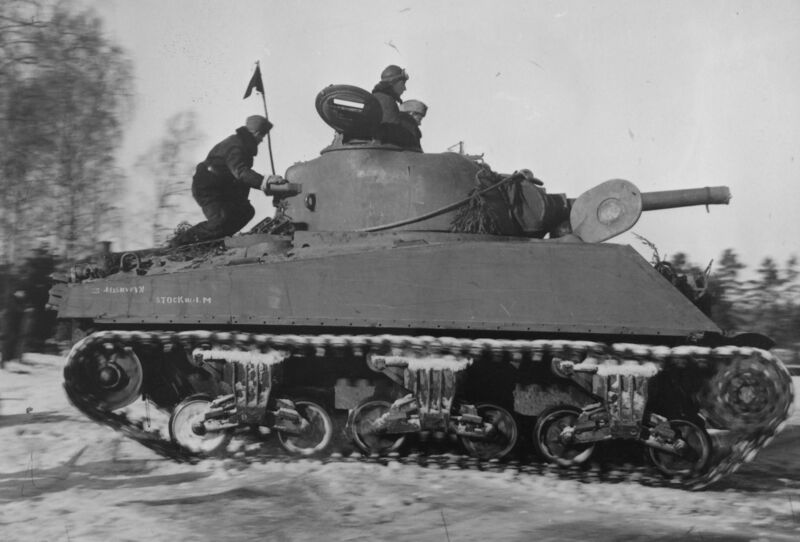 Other than the difficulties caused by the less than suitable track design on the Sherman V, the performance on roads has not been inferior to that of Swedish tanks to any meaningful degree. If the tracks had been fitted with spikes, many ditchings could surely have been avoided. 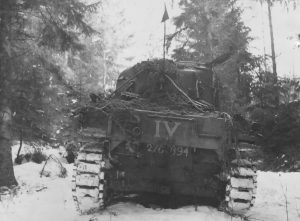 On one occasion, the night between the 1st and 2nd of March, it was intended to move the Sherman platoon from Stockshammar south of Askersund to a place northwest of the city along a rather poor road. Since this road was very narrow with steep banks and went through marshy terrain, and the tanks had to be driven with curtained lights, and that there was also a bridge that was forbidden to pass, this movement was discouraged and the platoon remained south of Askersund. In real field conditions where there need be no regard for property damage, and with drivers trained in night driving, this movement could have been accomplished with no great difficulty. The performance of the tanks themselves had nothing to do with the movement not being carried out as intended. On all occasions where the situation demanded it – for example in the case of blown bridges, taking cover for air raids, supporting infantry, etc – the platoon moved in terrain with no difficulty. Despite the ground being poorly frozen, the tanks showed no tendency to dig down. On three occasions, streams between 2 and 5 meters wide were crossed. On one occasion, during the crossing of Igelbäcken, Sherman III got stuck, in part because the track spikes were not mounted and in part because of a misjudgement by the driver. When the next tank had passed, the Sherman III was towed up by it. Repairs have only been done on Sherman V, namely changing out the left drive sprocket and removing and re-attaching tracks, which were thrown on two occasions. The only adjustment done has been to the engine clutch on Sherman V, which was damaged when it collided with a cliff face. The tanks are spacious, both in the driver’s position and in the turret. Thanks to this, all activities are made easier, both when driving and when handling the tank in general. The heat from the steering gear and transmission makes it pretty easy for the driver to stay warm. Personnel standing in the turret, however, is greatly bothered by the air flow through the turret hatches which is caused by the powerful suction of the fan. Since no radio was mounted in the tanks, the unit was difficult to lead. The commander has a very hard time to communicate with the driver when passing other vehicles etc, which led to some difficulties in such situations. If the tanks are intended to be used in further exercises, it is necessary to mount a radio, both for leading the unit and because road safety reasons require an intercom system to provide working communication within the tank. A radio can be mounted without significant difficulty and connected using cables already existing in the tank. The costs can be estimated to about 75 kr per tank. In connection to this, the shielding could also be tested and compared to that of equivalent Swedish equipment. The tanks have proven to be reliable and suitable to field conditions. This has been showed by the very few repairs and adjustments that have been necessary, despite the tanks not having gone through any complete overhauls after arriving in Sweden. The general impression is that the tanks have showed that they respond well to the demands one could make of them. If the tracks had been spiked the driving performance would have been even better. They have been easy to drive, despite the drivers having very little training in winter driving, and the unit has been able to complete the tasks it has been assigned. I’m not perfectly sure but I don’t believe these are the full extents of the elevation system – the depression is probably close to the max but I think the elevation could go another couple of degrees. To add to your enjoyment, here are a few pictures from the manual that shows how the system works. “Kvävgas” means “nitrogen”, and “olja” means “oil”. Oil is pumped from the front cylinder into the rear one, the rear swing arm is forced down and the tank depresses. Oil is pumped from the rear cylinder to the front one, the front swing arm is forced down and the tank elevates. 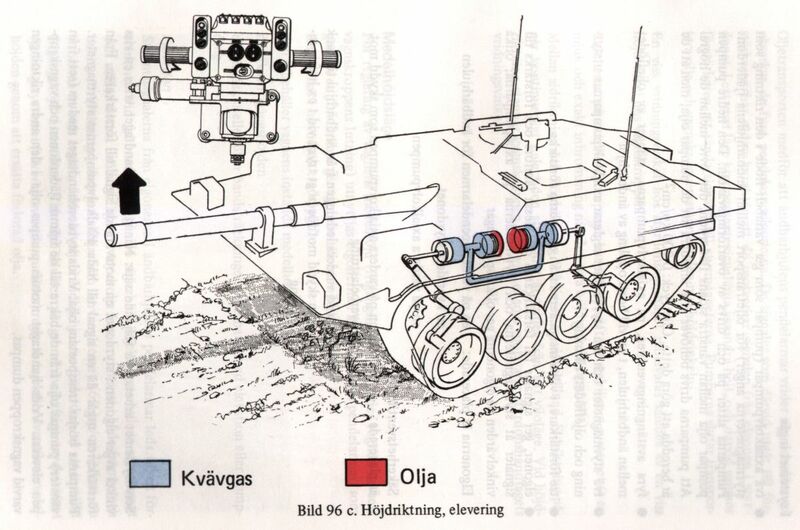 Schematic view of the strv 103 elevation system components. By the way, in case you ever wondered what the heck “elgon” means in Swedish and been unable to find out (the word isn’t in the Swedish Academy Dictionary and is basically ungoogleable), the appropriate English translation is synchro. Naturally, I mistranslated it at first, so where it says “resolver” in the schematic above, it should say “synchro”. 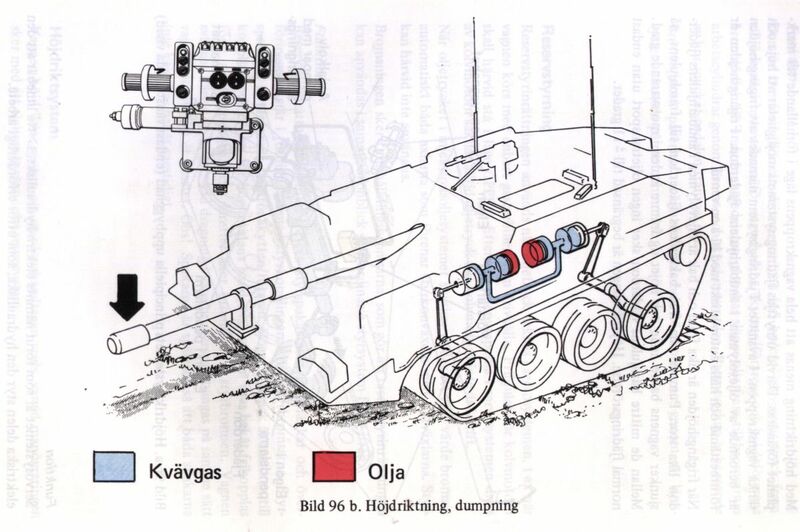 I have previously posted the Swedish report from the BAOR trials of the strv 103, but at that time I only took the time to translate a few brief excerpts that I thought were funny. In this post, I’ll go into some more detail and discuss the reasons the Swedish delegation had such scathing things to say about the BAOR. It is somewhat bad form in military history circles to post anything that could be construed as negative towards another country’s armed forces, probably because military types tend to be hopeless nationalists. In this post, I will totally ignore that, which might insult a few people. I must therefore emphasize that these are not my own opinions. As mentioned in the translated excerpts, during the basic training on the strv 103 in Sweden, the Swedes found British discipline to be rather lax, but more importantly the British gunnery skills were regarded as unacceptably bad in the first trial (after a re-trial, this was upgraded to a mere “poor”). While discipline is subjective, gunnery skills are objectively measurable, and it might be interesting to see how poor the full-time professional soldiers from 2nd RTR crews were compared to Swedish conscript standards. There was one commander who was not tested the first time around, hence the mismatch in numbers between the two rounds. Results were even worse when it came to how long it took between a target showing up and the crew opening fire. Swedish training regulations called for no more than 17 seconds; the best British score was 18.5 seconds and the worst 36 seconds (mean: 28 seconds). This was not solely because of low crew standards, but rather because the British doctrine forbade the gunner/driver from acting on his own initiative: orders from the commander were always required for everything, and this slowed things down considerably. The only trial in which the British crews were mostly up to par was target spotting (tested as a crew, not individually). The training regulations called for spotting 74% of targets on a standardized training course; the British crews achieved a mean of 72% (worst: 55%, best: 95%). Considering the results above, it is not difficult to see why the Swedish observers wrote that “a large portion of the British gunners simply weren’t suited to their job”. Some of them wore glasses, which would have been an impossibility in the Swedish army: conscripts had to have perfect eyesight to even get considered for assignment as tank crews. During the actual trials, the British crews complained about how much time they needed to spend on daily maintenance tasks. In a particularly acerbic comment, the observers concluded that this was mainly since on the Chieftain, crews usually took shortcuts on the maintenance if they bothered to do it at all, but on the strv 103 the contract with the Swedish army forced them to do it by the numbers. The observers also noted that the 1968 test report had concluded that the strv 103 needed less time for crew-serviced maintenance tasks than the Chieftain did. In the public perception, conscripts tend to be viewed as poorly trained and motivated. However, as demonstrated here, the recruitment method used does not necessarily determine soldier quality. It is possible to train full time soldiers more and longer than conscripts, but this is not always done. Poor motivation and low morale can be found in both conscript and professional armies (Swedish conscript motivation varied over the years – for example, when the public perceived less of a threat to the country, motivation tended to be lower and morale was worse). Conscription also provides the opportunity to pick and choose the person best suited to the job out of all able bodied men (and women, these days) from each age class. It should be kept in mind though that this report was written at what was probably the very peak of the Swedish Cold War army: around the mid-1970’s, budgets started shrinking, refresher exercises were reduced and basic training periods were shortened. At the same time, these years were probably some of the worst for the British army. By far the biggest beef the Swedish delegation had with British tactics was the very wide spread of tank formations. The observers complain in several places in the report that the British platoons could spread as far as 5-600 meters on the offense, and up to 800 meters on the offense. In part, this friction was caused by doctrinal differences. 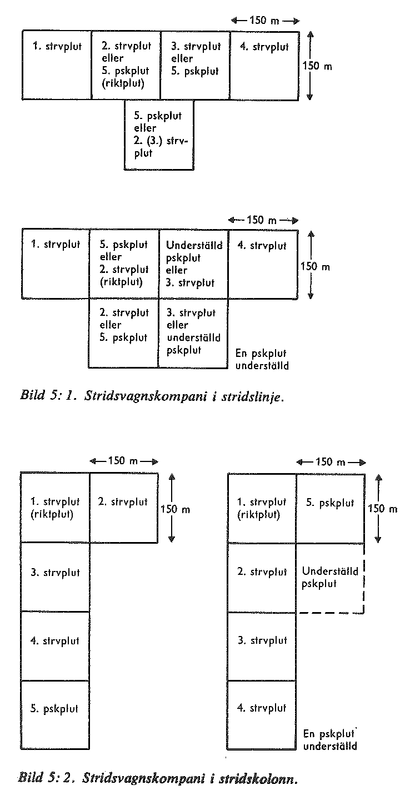 Swedish tank platoons were, as per the field manuals, assigned front sections no more than 150-200 meters wide – a British platoon could cover the same width as an entire Swedish tank company did when attacking in line formation (see graphic). The Swedish school of tanking was heavily German-inspired, with schwerpunkt and auftragstaktik and all, so concentrating forces was essential to the tank formation commanders. This is perhaps best illustrated with a few choice quotes from the 1966 field manual for Swedish armored battalions (the bold parts are in the original). 1:17 Our armored units must be prepared to meet enemy units that are superior to ours in various ways, for example in the number of tanks. Our units shall compensate for this superiority by mastering suitable tactics and ways to do battle. 1:19 The firepower, mobility, ability to pass difficult terrain and armor protection of the armored units shall be used for quick and surprising attacks with concentrated forces. 1:24 Fire and maneuver are the two main components of battle. They must be coordinated in both time and space. Fire – especially tank gun, anti-tank gun and artillery fire – is the most important component of the battle for the armored units. The fire is complemented by the use of smoke. 1:27 The opportunity to create local superiority must be exploited whenever possible. Local superiority is mainly created by concentrating the fire from tank and anti-tank guns and artillery, as well as by the use of smoke. When fighting enemy armored units, it is not just merely the number of weapons that determine local superiority. The unit that is first to open fire and shows the smallest target is usually the one that succeeds. Quick and well-aimed fire is of crucial importance. Local superiority shall be used opportunistically both for anti-tank work and to neutralize the enemy anti-tank units. 1:28 Concentration of force means that sufficient resources, especially fire, are focused in time and space. Concentration shall be brought about in the direction or in the area where a decisive result is sought or expected. In other directions, the weakest possible resources are assigned. The concentration of force is usually achieved though coordination of several different units. In many cases, assembling several companies in a relatively small area is required for the concentration to be effective. Before the battle is started, however, they shall be gathered for as short a time as possible, so the enemy does not have time to deploy nuclear weapons against them. When assembling an armored battalion, two or more companies should not be assembled for more than an hour. In a crisis, focusing fire – especially tank gun, anti-tank gun and artillery fire – usually the quickest way to turn the situation around to our favor. 2:2 The fighting actions of armored units usually develop quickly and violently, with frequent and sudden changes in the situation. Frictions are a constant. A commander must be able to quickly find his bearings in every kind of situation. Even with limited intelligence and in the most difficult of positions, he must be prepared to make crucial decisions and carry them through. For a commander, indecisiveness and failure to act is a greater failing than choosing the wrong means of action. 2:11 In war, only simple things are possible. Straightforward plans, well executed, are the safest path to success. These passages (particularly 1:28) should be enough to give at least an overview of the Swedish doctrine: focusing fire (both tank gun and artillery fire) from good positions and concentrating forces in small areas were seen as crucial components of success. Contrary to what you might think, Swedish armor officers were doctrinally very aggressive and taught to attack in almost every situation to gain and retain initiative. Concentration of force and especially of fire was seen as absolutely essential on all levels, and the observers complain a lot about how the Brits don’t do this, or don’t do it enough (the wide deployments usually prevent focusing fire within the platoon). These complains are, of course, a lot more subjective than gunnery trials, but the observers note a number of tactical situations from the exercises that seem to confirm their view that the British habit of deploying tanks 3-400 meters from each other isn’t appropriate, which brings us to the next section. During the trials (both the fixed situations intended to compare the strv 103 and the Chieftain and the bigger field exercise), the observers noted many behaviors that seemed odd or downright bizarre. As mentioned, one of these was the great width used within British platoons. In several of the fixed situation trials (especially on the defense) this led one of the tanks on either flank getting isolated, overrun and destroyed. Focusing fire was rarely possible, which led to most situations ending up as duels. In one of the trials, the observers note the entire thing as “a great example of how this type of battle should not be fought”. Another common complaint is poor coordination in general but especially poor coordination with infantry. 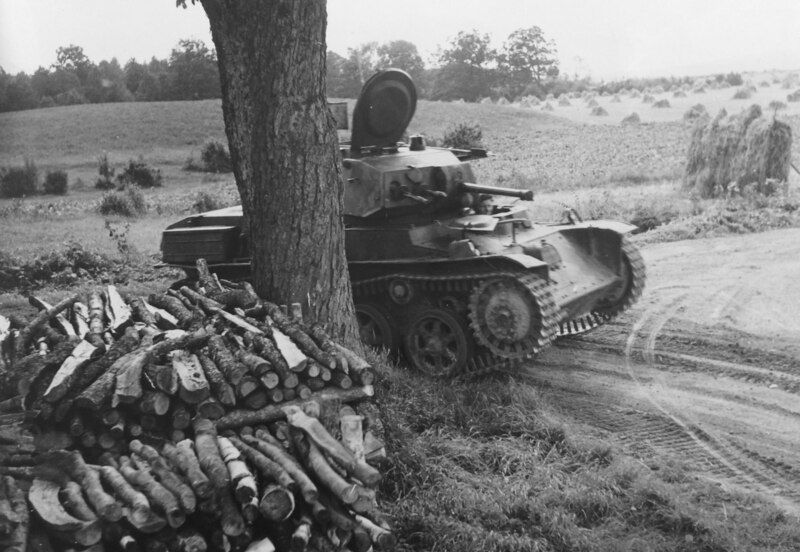 In several cases the British tanks advance on their own into and through forests. In at least one case, tanks advancing along a narrow forest road together with infantry on foot does not use the infantry to scout the sides of the road or ahead, leading to the tanks driving out into an intersection where there’s an enemy tank in ambush. The infantry is not called upon to locate the enemy tank even after the first tank in the column gets destroyed. This was seen as bizarre by the Swedish observers, who in many similar situations in forests etc called for dismounting the rear driver and using him for observation on foot. 1. All 103’s in firing position at the start of the exercise. 2. APC’s advance. All the commanders in “peace driving mode” with their heads above the edge of the hatches. The APC’s drive up in a column, stops 50 meters in front of [a defending tank]. Infantry dismounts. Pure madness! 3. When the infantry attacks from the right, [the defending tank] turns the entire vehicle and fires with the fixed machine guns, without turning the cupola and opening fire with the commander’s MG first. An older German local gentleman (retired officer?) came up and asked if you really could do things this way. Artillery and smoke were used sparingly if at all during the field exercise, despite artillery officers and forward observers being attached. The observers complained much about how there was no concentration of fire in that respect either, nor any coordination of fire and maneuver to speak of. There were also several complaints about passivity in general – tanks sit still in prepared positions despite being attacked without seeing the attacker, that sort of thing. In many cases the observers also complained about what was seen as blatantly incorrect behavior, like advancing a tank column into an ambush without recon. I’ll just post a translated excerpt from the report here. (1) Armored vehicle (Chieftain, FV 432) reliability seems quite low. When there are no exercises ongoing, the vehicles are test driven once a week. When units or parts of units leave for service in Cyprus or Ireland or for exercises in Canada, a minor detachment is always left behind to service and check on the vehicles. When the armored vehicles are parked in their garages, they are not filled with ammunition or the crew’s combat equipment, as is done at f.ex. American units. (2) Since units and parts of units that are assigned to the BAOR are in service on Cyprus, in Ireland or are on exercises in f.ex. Canada, the forces present in Germany likely have a relatively low readiness as a fighting unit. Additionally, personnel is more or less constantly transferred between units, so the units are likely rather poorly trained as a team. (3) Each year, units typically do about two weeks of exercises in Soltau, two weeks of gunnery training in Bergen Hone and one bigger field exercise/maneuver in the Kassel area. The rest of the year the personnel seems to spend their time mostly idle in their barracks. Every second or every third year, the units are sent to Canada where live fire exercises and combat exercises are done. Alert response exercises are done about once a month. No such exercise was done during the current period. (4) Considering the state of the equipment, the constant detaching of units, the circulation of personnel and what has been noted in other places in this report regarding the skills of commanders and crews, as well as what officials have told us about alcohol and drug problems, the British Army of the Rhine should not be seen as being of any higher class. On Tuesday, the 20th of September, I’ll be doing an AMA on /r/WorldofTanks, starting from 20:00 CEST (18:00 UTC, 14:00 EDT, 11:00 PDT) and going on for as long as people keep asking questions, pretty much. Feel free to show up and ask anything about Swedish tank development, doctrine, anecdotes (or anything else regarding Sweden in WW2 or the Cold War that you might be interested in). Two strv 103’s were sent to the US for trials in 1975-1976. Seven US crews were trained and the tanks were subjected to a variety of tests, in which they were compared to a variety of odd vehicles, ranging from the mundane M60A1 AOS (add-on stabilizer) to a T-62, an RVT-2 (a West German experimental vehicle with 1800(!) horsepower – see the comments section for more information) and an XM808 TB (8-wheeled Lockheed experimental vehicle). The report from these trials is over a thousand pages long, but I have only managed to find a small part. I’m working with the national archives to get the entire thing declassified, but it’s been met with some bureaucratic issues due to the US classification levels. Nevertheless, I’ve obtained a few summary pages that in themselves contain a number of interesting tidbits. For example, did you know that when comparing gun laying times against a stationary target from the short halt, the strv 103B was faster to fire (although somewhat less accurate) than the M60A1 AOS? In the stationary vs stationary case on the other hand, the strv 103 layed slower but hit better. When averaging about 400 fired rounds of various types in a variety of situations against a variety of targets at different ranges between 500 and 2000 meters, the strv 103 hit an average of 77% of shots and took an average of 13.1 seconds to open fire, while the M60A1 AOS hit an average of 72% and took an average of 12.7 seconds to open fire (it should be noted here that the M60 was using its coincidence rangefinder, while the strv 103 had no rangefinder at all). In a mixed driving trial, the strv 103 was slightly faster than the M60 but accelerates slower. You can read the fragments in PDF form here – and for once, they’re mostly in English. 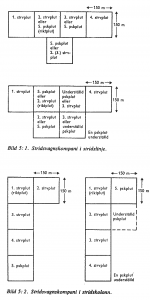 This post is obviously completely unrelated to tanks and might actually be better under the Reference documents tab, but occasionally weird Swedish cold war byproducts come out of my archival research. In the Swedish Air Force, a the flight manuals were historically called things like Fpl AJS 37: speciell förarinstruktion (“Aircraft AJS 37: special pilot’s instructions”, where “special” is used in the sense that these instructions are particular to this aircraft type), where speciell förarinstruktion was abbreviated SFI. There was usually one unclassified part and 2-3 classified ones. In the last year, the national military archives have kindly declassified most of these manuals for the strike version of the Saab 37 Viggen, the AJ 37 and its 90’s updated version, AJS 37. I’ve turned these into PDF files for your convenience. They are all in Swedish, of course – since the Viggen was never exported, they were never translated. Published by FMV:FLYG in November 1994. Open, unclassified. Contains a general technical description of the aircraft and most of its onboard systems without going into too many details on sensitive points. Published by FMV:FLYG in February 1975. Formerly classified secret, declassified on January 20th, 2016. Contains technical descriptions of sensitive onboard systems such as weapons, radar, countermeasures etc, as well as a description of some typical mission profiles. According to the index it should also contain five more chapters, but these were missing in the binder in the national archives. However, those same chapters are in the Fpl AJS 37 SFI above – albeit for a slightly updated version of the same aircraft. Published by FMV:FLYG in July 1979. Formerly classified secret, declassified on January 21st, 2016. Contains aerodynamic performance charts of various kinds – acceleration, rate of climb, combat range, etc etc. The chapter on turn performance is missing. In internet arguments and popular culture, it is frequently claimed that the stridsvagn 103 (strv 103, “S-tank”) was a defensive tank, or basically a modern tank destroyer. It was, claims the common wisdom (perpetrated and repeated in media such as History Channel), meant to dig down in a forest, take a few shots at attacking Soviet tanks and then retreat, using its rear driver to its advantage. In the recently revealed Swedish tree for World of Tanks, it is indeed classified as a tank destroyer – mainly for game mechanics reasons, though, not because of a misunderstanding of its role. 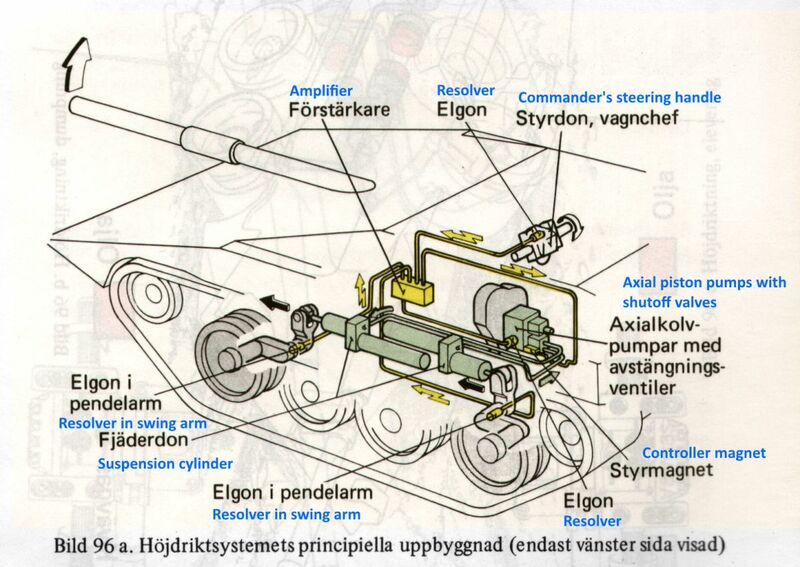 Even in the Swedish army, some officers (mainly ones who had no experience on the tank) thought it was worthless for traditional tank work – that is, offensive tasks. In this essay, I will show that this is simply not true: the Swedish army set out to figure out how to build a good tank, came up with the S-tank idea, developed and built that idea as a tank, which it then proceeded to use operationally as a tank. A strv m/40L belonging to 1. armékåren on exercises in Skåne, September 1942. Note the hay drying in the background. 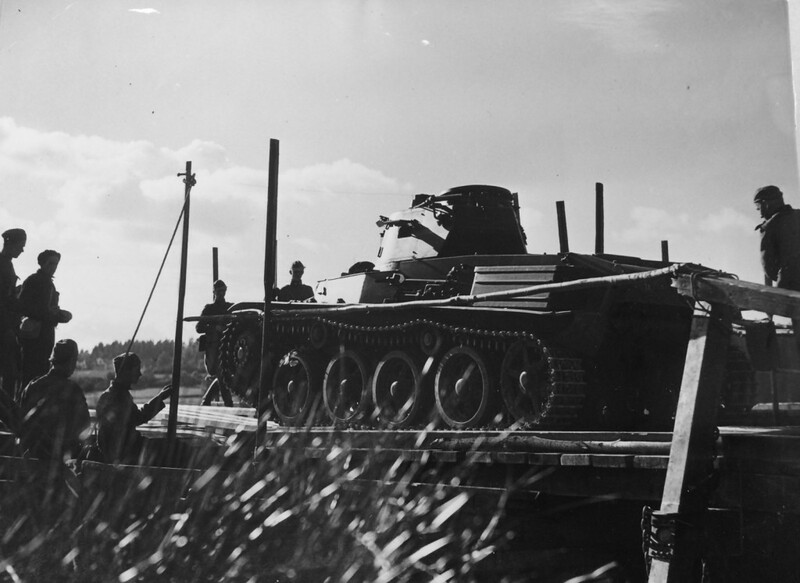 A strv m/38 being shipped over a lake on a pontoon. Uppland, 1939.